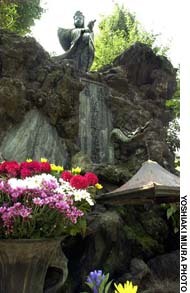 Temples, shrines, gardens, the Imperial Palace . . . Why, tourist guidebooks are full of places that echo the form and spirit of the Old Edo that once was. But they’re only telling you a part of the story. This city of an estimated 1 million souls — which, back in the 17th century, made it the world’s most populous — was a beehive of human activity, not all of it legal. 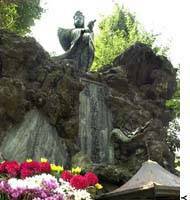 The Tokugawa rulers took a stern, legalistic approach to violators of the law, and punishment, when it came, was unforgiving, swift and often public. If you’ve grown tired of mundane cultural sites, or seek a more down-to-earth view of how people lived, played and died in Old Edo, these gloomy remnants of its dark side await your visit. All you have to do is hop onto the Eidan Hibiya subway line: They can all be accessed easily from stations along the way. The four sites that follow have been arranged, from north to south on the Hibiya Line, starting with Minami Senju Station. More information is available on the Internet (all Web sites are in Japanese). 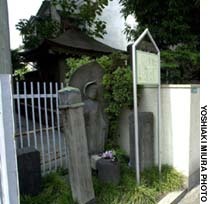 The Kotsukappara execution grounds (nearest station: Minami Senju) were in use from the mid-1600s to 1873. These grounds once covered an area larger than a football field, where executed convicts and those who died while in jail were interred in shallow, unmarked graves. Today, newspapers occasionally report the discovery of bones whenever road construction is undertaken in the area. Most of the original execution grounds now lie beneath the train tracks. What remains is squeezed into a small corner between the JR Joban Line, a railway freight yard, and the road in front of the station. To the right of the station’s South Exit, you will see two temples. Enmeiji Temple, on the left, is the more photogenic as it features a 3.6-meter-high Kubikiri Jizo erected in 1741. Its name meaning “neck chop Jizo,” this statue was the only solace available to the condemned, who received no ministrations from the clergy in their final moments. 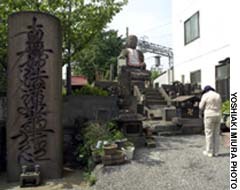 A large engraved stone in the foreground bears the cursive characters “Namu myoho renge kyo (Hail, Book of Lotus of the Good Law),” the prayer of the Nichiren sect. Eko’in Temple, on the right, is a branch of the original temple in Ryogoku. 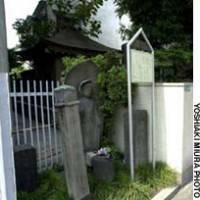 Its cemetery contains memorials to Nezumi Kozo, a famous burglar executed in 1832; nationalist teacher Yoshida Shoin, executed in 1859; and Takahashi Oden, a murderess who had the distinction of being the last criminal to be executed by decapitation, in 1879. 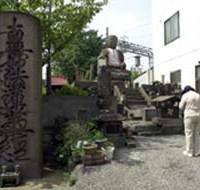 Also of interest is the monument commemorating one of Japan’s first scientific autopsies, performed by physician Sugita Gempaku in 1771. To get there, leave Minami Senju Station by the South Exit and turn right. The two temples are immediately across the street. Jokanji Temple (nearest station: Minowa), just off Nikko Kaido, dates back to 1665 and became known as a nagekomi-dera (throw-in temple). When a prostitute in the nearby Yoshiwara brothel quarters died and no one claimed her body, it would be wrapped in straw matting and abandoned outside the temple gate. The spirits of about 25,000 prostitutes and fire victims are said to be consecrated here, and just outside the entrance to its appropriately gloomy cemetery is a muento, a memorial to the unknown dead. 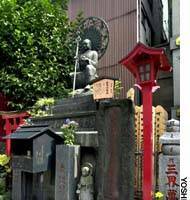 Jokanji Temple is also associated with novelist Kafu Nagai (1879-1959), whose stories often featured the types of women buried there. His colleagues erected a monument there to mourn his passing. On leaving the only exit of Minowa Station, take a right, walk 40 meters past a beef restaurant and turn right, then the left fork. It’s on the left. “Yoshiwara” (nearest station: Iriya), the pleasure quarter of old Edo, doesn’t exist on modern maps. This district in Taito Ward is now officially known as Senzoku, but it has serviced male libidos since 1657, when the Tokugawa shogunate ordered the relocation of the Yoshiwara pleasure quarters after the Great Fire of Meireki. Exactly 300 years later, the Anti-Prostitution Law obliged Japan’s public brothels to close. But the approximately 150 “soaplands” here today perform much the same functions as their predecessors, in the form of bathhouses offering a full body wash (and other varieties of stimulation) by an unclad masseuse. Few establishments seek patronage from foreigners, but the best time to see the girls who work there (while clothed) is around 5 p.m., when those finishing the day shift head for home. If you don’t have a good map, a short taxi ride from JR Ueno Station is recommended. Denma Rogoku (nearest station: Kodenma-cho) was, until 1875, Japan’s largest jail. Today the site is a public park, Jisshi Koen, which has a small garden and bell tower. Prisoners suffered overcrowded conditions and were forced at times to sleep in a seated position. Epidemic diseases took a fearsome toll. 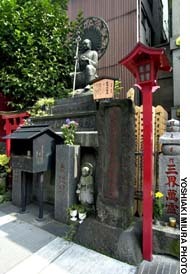 In front of Daianrakuji Temple across the street from the park, in what was the southeast corner of the jail, is a jizo marking the spot where executions took place. Afterward, new swords were tried out on the bodies, a practice called tameshigiri. Leave Kodenma-cho Station by Exit 4. Go left past McDonald’s, left at the intersection and left again after 10 meters to reach Jisshi Koen.